Did you know that the Uniforms for Star Trek Discovery were based on actual NASA uniforms? That is why they are so stylish. The Star Trek Discovery Men's Copper Operations Uniform, looks just like the shirt worn by Shazad Latif as security officer Lt. Ash Tayler in the series. 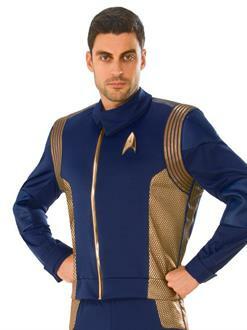 The lined blue top features a copper Starfleet badge and additional copper accents.